Tientsen. May 1924. 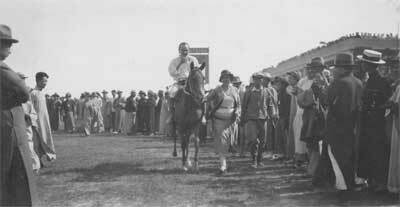 Bessie (Brown) Gilmore leading two of her winning horses (one called "Munster"). 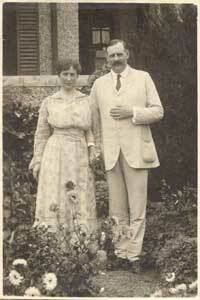 Samuel and Bessie were first cousins (Their mothers, Elizabeth & Sarah, were sisters). Although they had no living children, there is a record of one baby who did not survive birth. (SOURCE: A letter from Mary GRIFFIN to Sally WHITESIDE , 27 January 1917(Doc. 85): “Bessie Gilmore is getting strong again in Teintsin after her bad confinement. Her poor baby had to be sacrificed to save the mother's life.”. This wasn't long after they left for Tientsin. We can guess at the date which they left for Tientsin because on March 1916, Mary GRIFFIN wrote to Sarah WHITESIDE: "Bessie and Sam Gilmore are about to start for Teintsin. They will likely sail in April." (See Mccul083.txt). Dorothy ROBERTSON tells how Samuel and Bessie lost everything in the war, racehorses, the whole lot when the Japanese invaded China and Hongkong. We know little more than that - except that there is a record at www.hongkongwardiary.com showing a Mr. Gilmour in room 140 at the Mee Chow Hotel. Amanda KNOX, the current owner of Killynure, remembers letters still being sent concerning Bessie’s estate (and this would be after 1960). There were also letters to her sister-in-law, June “Jeannie”BROWN, concerning Tootles shirts (to the estate of Elizabeth Brown or her executor). My father, David Hugh Plunkett BROWN, had told me years ago that Samuel GILMORE was Chairman of the Persian Stock Exchange. I haven't been able to verify this. His sister, Dorothy ROBERTSON, queries the Persia part since Bessie & Samuel seemed to live most of the time in Tien-tsin which is in the Peking part of China (North-East). Since Persia encompassed what are now Iran and Iraq, some more fact checking is needed here. It is possible that this is the same Samuel Gilmore who was a junior at Shanghai for the Hong Kong Shanghai Bank (see pg. 581 Frank HH King The History of the Hongkong Shanghai Bank). Since Samuel is also a nephew of Sir Thomas Jackson, this wouldn't be a stretch. There was also a cousin - Acheson Henry George GILMORE who was a junior with the Hong Kong Shanghai bank from 1898 until he died there in 1906. (see Frank HH King, p581.) In 1904, HSBC records show him to be at Tientsin. He too was a cousin of Samuel Gilmore. There is a photo Shanghai 1898 unidentified in my files. It is also possible that it is Samuel's cousin "Samuel James GILMORE" son of Samuel GILMORE & Georgina HENRY who is the HSBC man - though this is doubtful.